Hello from the ‘Little Apple’–Manhattan, Kansas! It’s Round 3 of Primary Recruitment here at Kansas State, and I could not be prouder of our Alpha Gams for the work they have put in all year to make this week happen. We are one day away from Bid Day which feels so surreal but is also just the most wonderful thing. Two claps and a punch for NEW MEMBERS! But I’m getting ahead of myself here. Let’s take it back to the end of June, when the Leadership Consultant team arrived at Headquarters to start the first leg of our travels. 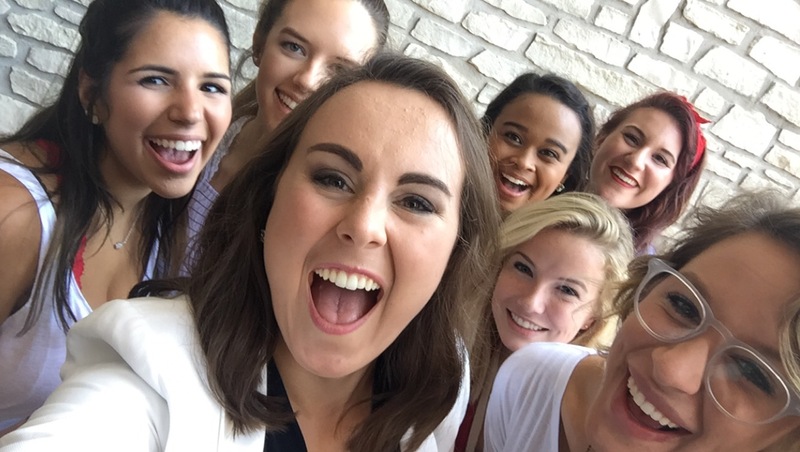 Summer training in Indianapolis was a whirlwind of information and learning exercises that laid out everything you could ever need to know about Alpha Gam and the consultant role. The best part of this experience for me has been seeing how the Fraternity operates on an international level–it’s the same organization that has always been so dear to me personally, but it also connects women of all ages from across the world, all bound by the same letters and purpose. It’s crazy to think about and still gives me chills. This year was also my first time getting to attend International Convention, which was an inspiring way to start my year of traveling and get into the mindset of why I want to work for Alpha Gam. Being members of staff meant that we not only got to experience convention as attendees, but also got the inside scoop on everything that went on behind the scenes to make the magic happen–and guys, it’s a LOT. There are so many dedicated people who come together to make this a meaningful week for our attendees, and it was neat to be a part of that process. Not to mention, our LC team got to initiate five women into the Fraternity in front of our International Council, Volunteer Service Team, Staff, and all 700+ collegiate and alumnae attendees. Somebody pinch me–WHAT? It was hands down one of the most special and meaningful things I’ve ever gotten to do. Another shoutout from this summer goes to my consultant team. These women are eleven of the most dedicated, convicted, and intelligent people I have met, and they all come from such different collegiate experiences but are committed to the growth and development of this same organization. I’m very lucky to have them. After all our hard work and preparation this summer…we were off! Natalie and I boarded a plane on August 3 for Tuscaloosa, ready to spend the week with the women of Psi Chapter at the University of Alabama. 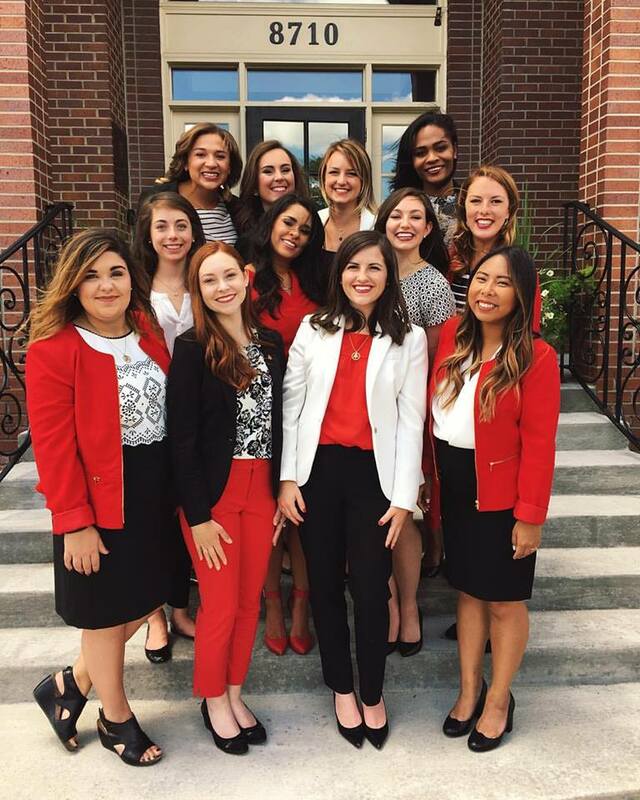 UA had a record number of women going through Primary Recruitment this year–almost 2,700, making it the largest formal recruitment week in US history! We arrived on Wednesday afternoon and jumped right into Polish Week preparations and meetings. I was immediately so impressed with how organized and motivated this group of women was. They had everything planned flawlessly and all worked together to make sure it all got done in the right amount of time. My favorite thing about UA Alpha Gam is their sense of pride in their chapter and their commitment to leadership and service. These women are ambitious in the best way–they LOVE Alpha Gam and everything it stands for, and they absolutely shine! The campus as a whole is deeply rooted in tradition, and Psi Chapter has been around since 1921, so naturally they are very proud of their history and have a fabulous support base of alumnae who remain actively involved in chapter affairs. Nat and I didn’t get the chance to stay all the way until Bid Day, but we were cheering from afar as our women welcomed 150 new members. What an exciting year they have ahead! Sisterhood day theme–Camp Alpha Gam! This is what we were greeted with upon arrival. It was an enthusiastic welcome to say the least! I hugged Natalie goodbye at the Birmingham airport on August 8, which is when the really unexpected adventure started. I just so happened to have booked a flight with Delta on the very day they faced an international computer outage and had to shut down flights all over the world. COOL. After 10 hours of flight delays and two airport meals (shoutout to Jim & Nick’s BBQ in the BHam airport for being my lifeline), I headed to a hotel for the night and decided to try again the next morning. Yet again, my flights were delayed, and I ended up taking a different flight with American Airlines and finally arriving in Kansas around 10:30 PM. It was a very long couple of days but also makes for a great story! I love that this job is a constant lesson in learning to adapt to whatever life throws your way. It’s teaching me, with my color-coded agenda and type A personality, to be much more flexible, a lesson I am eternally grateful to learn. Upon arrival in Manhattan, Emily, Kelley and I got started right away with Polish Week the next morning. Epsilon Chi Chapter was established last fall on KState’s campus, so this is their first year being part of Primary Recruitment. These ladies are quite literally creating history for their chapter and it’s a beautiful thing to watch. They are such an uplifting and positive group, and we had a blast doing workshops and sisterhood activities to prepare to meet the women coming through recruitment this week. We’re now four days into recruitment and I could not be more proud or excited for them! Repping Team USA during recruitment workshop! Kinley is the founding Chapter President and such a gracious and inspiring leader. She has led the chapter to such heights already! These women teach me what genuine joy and intentional community look like put into action. Being a new chapter on campus can be a challenge, but it also provides unique opportunities to leave a legacy that will impact women decades down the road. They are forging a whole new path that is going to change hundreds and even thousands of lives. Honestly, they’re my heroes. This job has been the greatest gift and growing experience–and we’re only two months in! I’m looking forward to sharing more as I head to a new location next month (Hint: It’s in my home state!) and continue working with chapters across the nation.